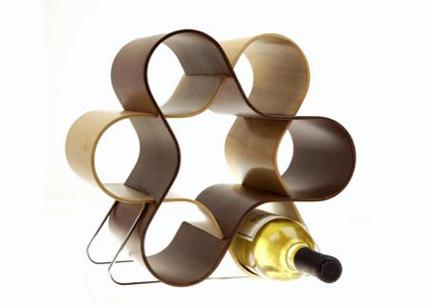 Hold up to seven wine bottles (six regular and one oversized bottle) with this elegant wine rack. The Wine Knot is designed by Scott Henderson, Tony Baxter, and Alberto Mantilla. They used two intersected birch & walnut molded plywood components, creating beautiful artistic pockets to display each bottle of wine.